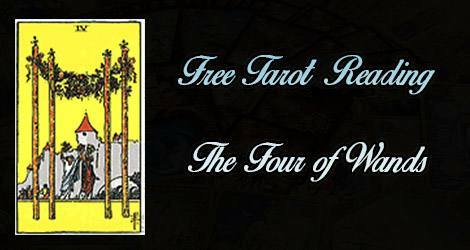 Four of Wands is a card of celebration and in this position can indicate improving health and increased energy. Take time to engage in activities that are both fun and physically challenging. This is a card of new beginnings and celebrations. It speaks of rights of passage and is the traditional card of weddings and other large celebrations. It can indicate a turning point in life where you feel uplifted and renewed. It speaks of hope and anticipation. Also a re-dedication to yourself and bettering your position. Four of Wands indicates growth and coming into a new cycle of life. This is a card of hope, promise, and understanding that all of your experiences contribute to your growth. This card also reminds us to take time out every day to celebrate the blessings in our lives. Stay focused on the privileges you enjoy and that positive outlook will help you attract more positive experiences and abundance.